In order to understand the benefits of a mobile app for retail in the current market, one must look at where it all begun. A decade ago, the first iPhone was released to the public, shaking the cell phone market to its very core. As the first true smartphone, the iPhone offered the user a tremendous number of features and processing power. A feature that was truly remarkable, was the app store. One could argue that the ability to dramatically expand the phone’s functionality through the download and use of mobile applications has revolutionized not just the industry, but our daily lives. From simple gaming, unit converters and currency exchange monitoring apps to banking, insurance, stock trading, and retail apps, mobile applications have made the smartphones of today so versatile and useful, that for most of us, it is the single most valuable possession, without which we would feel lost. With the advances in mobile devices and a continuous increase in their capabilities, it is no surprise that more and more consumers are using their mobile devices as the gateway into their online shopping. A Monetate e-commerce quarterly report has shown that e-commerce conversion rates have shifted with a conversion rates on mobile devices being higher that those carried out on traditional desktops and laptops. According to the study conducted in Q3 of 2018, the average conversion rate per device type was 3.94% for desktop and laptops vs 5.62% on tablets and smartphones. 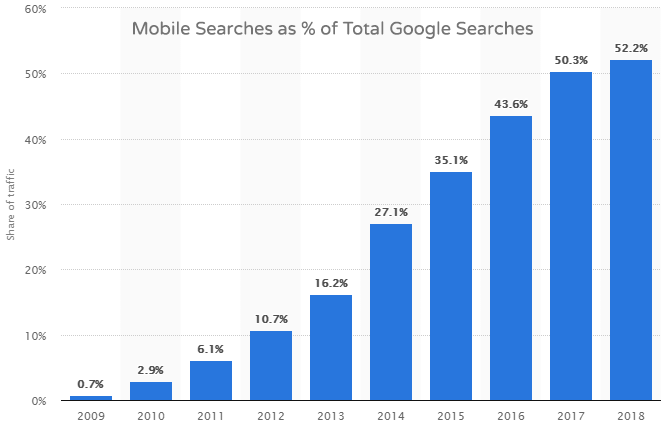 A recent report by Statista has shown that mobile Google searches have consistently been on the rise since 2009, finally surpassing desktop searches in 2018. With Google pushing more and more for websites to be mobile friendly, there is no longer any doubt that the mobile channel is the main conduit of consumer interaction with the web. 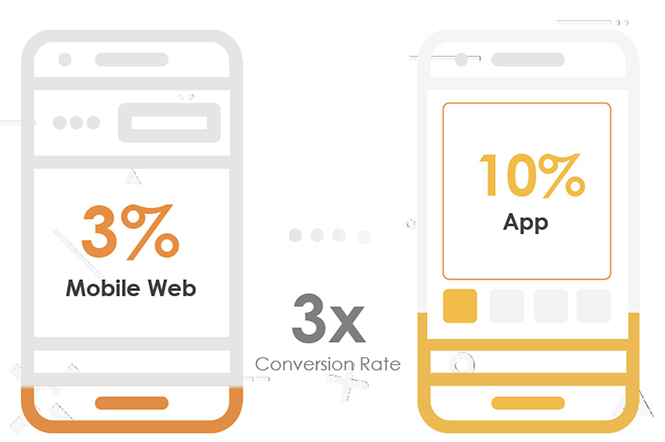 A 2018 report by Criteo indicates that in North America, among retailers that have a mobile app and a mobile website, the conversion rate through retail apps is more than 3 times higher than on a mobile web. Some of the results might have been impacted by the fact that consumers that download and use retail apps are usually more loyal and dedicated to buy from that particular retailer in the first place. However, one must ask, why are they more committed and loyal? As we mentioned in a previous article on customer experience and retail trends of 2019, customer experience is this year’s major focus point for retailers across the industry. As many as 80% of organizations are expecting CX to be their major competitive differentiator in 2019. So how does a mobile app for retail improve the customer experience? Websites are designed for hovering and clicking as the main interaction methods. This is great when the user has a mouse, however things become more challenging on a smaller touch screen. When hovering over a menu to reveal the sub-menu is impossible due to the lack of a mouse, mobile sites have to push the users through clicking on a number of menu items in order to get to the desired page, creating avoidable friction points. Having been designed for finger interaction from the get go, mobile apps offer users a more seamless experience. With more natural swipe gestures taking over a number functions, reducing the required number of clicks/taps. In addition to more seamless screen flows, retail mobile apps can offer the convenience of one tap order placement through digital payment systems like google wallet and apple pay as well as seamless secure access through thumb print and facial recognition. The benefits of Augmented Reality for retail are quite substantial and will continue to grow as AR becomes more common place in our everyday lives. One of the main advantages of cutting-edge retail mobile applications over mobile sites is that they have the processing power to enable complex AR experiences that engage consumers like never before. Furnishing and decorating an entire room with virtual furniture and home decor items with precise dimensions and seamless order placement is the type of feature that has proven to increase conversions and decrease returns. 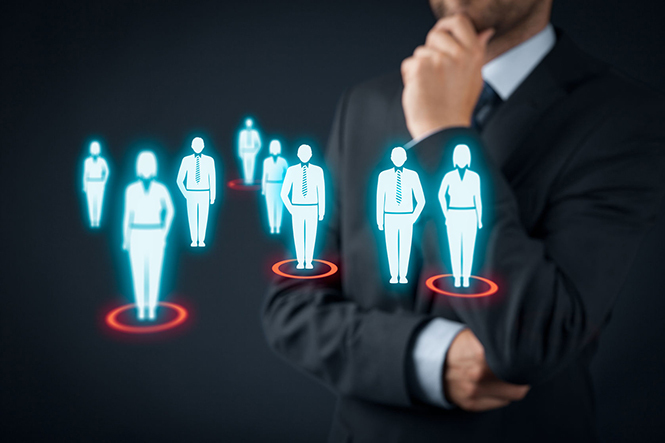 One cannot underestimate the value of an effective loyalty program. Starbucks, the world-famous coffee shop has reported 21% of its annual profit originating from its mobile app. By allowing users to place orders through the app in order to skip the line and then rewarding them for each order placed with points that can be spent on free items, Starbucks has monetized on two major consumer drivers: a desire for immediate gratification (or with as little wait as possible) and free products. Another great example of an ingenious loyalty program is that of Burger King. Having realized the potential of AR and its possible applications, Burger King has started experimenting with it by incorporating it in their loyalty program. On a pilot campaign in Brazil, Burger King encourages their customers to use their app to scan any ads from their competitors. Once an add is scanned, the app virtually burns through it and offers points to the user. By scanning a certain amount of competitor ads, Burger King’s customers are rewarded with a free whopper. Mobile applications for retail provide not only an engaging, convenient and seamless experience to consumers, but also the tools retailers need to track and analyze customer behavior. Data is becoming more and more valuable every year as the quality of its analysis and number of applications continues to grow. Having insight into what customers are doing within your app can prove invaluable for successful optimization of future promotions and product offerings. 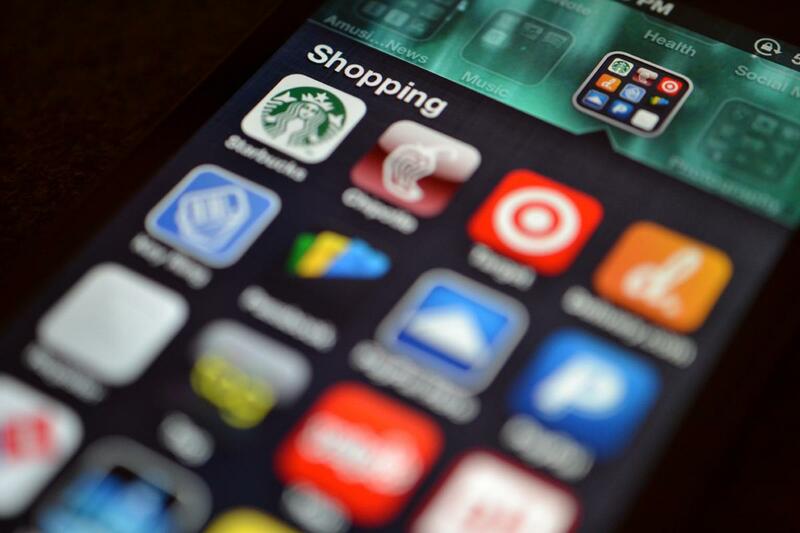 Another one of the benefits of a mobile app for retail is the targeted messaging capability. In-app messages, push notifications, live chat and Geo-fencing are just a few ways in which retailers can use the app to communicate with their customers. During ShopTalk 2019, Daniel Alegre, President of Global Partnerships at Google provided some insights from the search giant on consumer behavior. Alegre noted, “half of all customers confirm inventory availability before driving to a store, 50% of online shoppers are inspired to purchase from an image, and 50% of customers say they purchased elsewhere because information wasn’t customized to their current mobile situation”. The fact is that in today’s world any retailer striving for growth needs to be providing a seamless, convenient and consistent customer experience across all channels. The Omni-channel approach is the way into the future and the benefits of a mobile app for retail allow retailers to enhance the mobile channel to its full potential.